The Heinz Chapel organ is one of the most mechanically intricate and fragile of the building's many components. As a complex machine continually in use, it requires regular repair, maintenance, and even total renovation. In the course of seven decades, three instruments have served the chapel, each with its own particular distinction. The original organ to serve the musical needs of the chapel was created by the Aeolian-Skinner Company of Boston, Mass. The organ was a four-manual instrument placed about 18 inches below the chapel floor in a “pit” in the chancel area. It contained approximately 4,295 pipes and 78 stops. Mr. Frier, Heinz family organist, advised Mr. Howard Heinz on the specifics of the organ’s construction. Russell G. Wichmann was appointed as the first organist at Heinz Chapel before the completion of the building. He consulted with G. Donald Harrison, from the Aeolian-Skinner Company, about changes to the instrument before its installation but was not able to make any significant changes because of the late phase of the project. The pipework was concealed in chambers throughout the chapel. “Loft curtains” were used to cover the pipework on the two main chambers to the right and left near the entrance to the chancel. The tapestries of gold and blue ecclesiastical cloth had a “fleur de lis” pattern embroidered in metallic thread. Heavy, black curtains draped the remaining chamber openings in the chancel area. The pipework for the “Echo” division of the organ was placed in a ceiling chamber, almost 90 feet above the center of the chapel transept. Dr. Robert S. Lord arrived at the University of Pittsburgh in 1962 and took the position of chapel organist in addition to his academic duties in the Department of Music. At the time of his arrival, the Skinner instrument was in poor condition. Russell Wichmann was serving as the organist at Shadyside Presbyterian. As a friend of Dr. Lord and the Heinz family, he was asked to assist in the process of designing a new instrument. In January 1969, the University of Pittsburgh entered into contract for a new instrument with M.P. Möller Inc. of Hagerstown, Md. The organ was a three-manual instrument with 3,954 pipes and 82 stops. The addition of a two-manual organ in the rear gallery of the chapel made it one of the few instruments in the United States with two consoles. Installation was complete in October 1970, and the organ was formally dedicated on March 21, 1971. At that time, two wrought-iron grills decorated with gold gilt rosettes were ordered to replace the cloth curtains that formerly covered the pipes. The Samuel Yellin Company, creator of the original ironwork for the chapel, designed and fabricated the grills. This addition was the result of Dr. Lord’s interest in the works of Charles Tournemire and other French organ composers. Much of their music requires an organ have pipes of 32' length to produce low sonorities and broad, deep, and penetrating tones. Unfortunately, there was not enough space in the existing pipe chambers to accommodate pipes of such tremendous size. The Allen Organ Company of Macungie, Pa., was able to digitally sample pipe organ tones, store them, and faithfully reproduce them at will in its electronic instruments. In this manner, they added three 32' electronic pedal stops to the Möller. The decision to restore and enhance the organ was hastened by new technology, ongoing maintenance concerns, and impending structural changes in the chapel. Dr. Lord, in consultation with David R. Salmen of the Reuter Organ Company of Lawrence, Kan., prepared a design plan that envisioned the instrument reflecting the magnificence of the building, its soaring height, fine Gothic architectural detailing, and exquisite stained glass. The new organ was recreated in 1994-95 by the Reuter Organ Company and represented a trend in American organ building to re-use existing materials in an environmentally friendly and musically sound manner. The chancel console controls all 4,272 pipes (73 ranks) and the three electronic pedal stops. A commanding tuba (trumpet) is housed in the expression chamber in the ceiling of the chapel. The main console was elevated to floor level and may be moved to the front of the chancel for concerts and recitals. Installation was executed by Reuter along with its local consultant, David C. Richards of the Allegheny Organ Company. Tonal finishing was done by Salmen and Stephen Barnhart of Reuter. The result is an organ that is very versatile for a wide variety of musical literature. The instrument has some particularly striking and useful French and English qualities, which, when coupled with the acoustics of the chapel, make it a sought-after instrument and venue for music with organ. The organ was dedicated on September 14, 1995, and an inaugural organ concert series followed. Today, the organ is used in many of the services and musical events at the chapel. 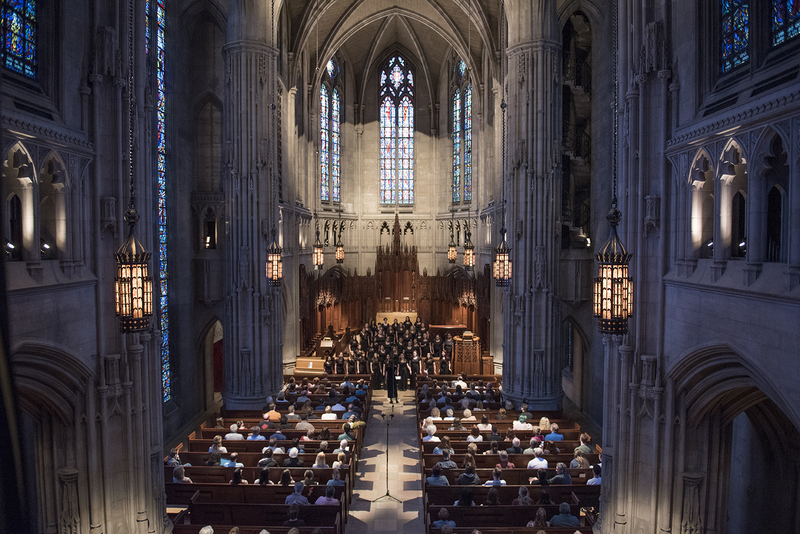 As a resource to the University community, in outreach to neighboring educational institutions, and in cooperation with professional organizations like the Pittsburgh Chapter of the American Guild of Organists, the current instrument is the expressive voice of this treasured place that speaks the poetry of music and song for all to enjoy. The original organ to serve the musical needs of the chapel was created by the Aeolian-Skinner Company of Boston, Mass. The instrument was a four-manual instrument and was placed about 18 inches below the chapel floor in a “pit” in the chancel area. It contained approximately 4,295 pipes and 78 stops.